Back to Parish & Company Home Page SOURCE: Parish & Company. Bill Parish Supports Eliot Spitzer, Industry Reform and Asks for Help in Securing a Stable Future for Portland General Electric. PORTLAND, Ore., February 4, 2005 See detailed comments following photo, including Mr. Spitzer's perspective on regulated utilities such as Portland General Electric being purchased by private equity firms with no SEC oversight. 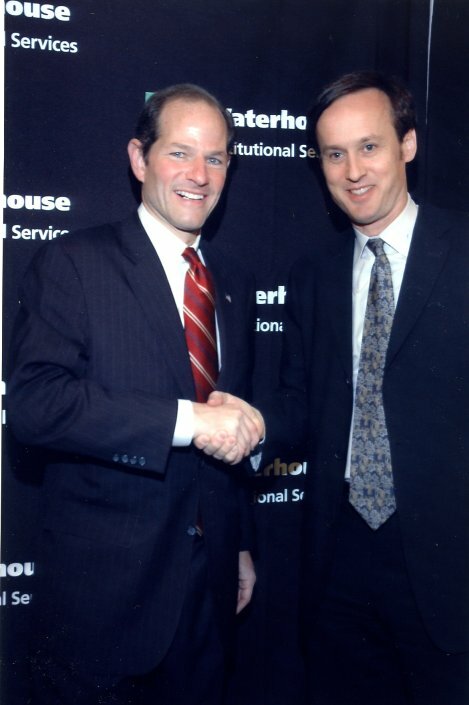 On February 3, 2005 Eliot Spitzer gave a keynote speech on corporate governance issues to roughly 1,000 institutional investment advisors at the annual TD Waterhouse Institutional Investment Conference in San Diego, California at the Manchester Hotel. Even his harshest critics, and there were many, came around to understand the importance of his work. Spitzer focused upon what he called free market "preemptions" that were undermining the integrity of the market. These include an increasing lack of needed disclosure and transparency. Regarding the Texas Pacific Group's proposed purchase of Portland General Electric he joked that "some people believe private equity firms are taking over the world." He then added that he was most concerned with the overall lack of investment in needed generation and transmission infrastructure in addition to such private equity firms purchasing regulated utilities and thereby eliminating necessary SEC disclosure. Spitzer is clearly focused, competitive and highly efficient in his efforts. When younger he was apparently a rather competitive tennis player in high school and optimistic on his prospects until he played the top seed at a rival high school, that person having been John McEnroe. Although McEnroe is a great player, it is now that I have appreciated him for the first time. Let's be thankful Mr. Spitzer became who he is and fully support his important non-partisan work. Parish & Company is an independent fee based investment advisor to individuals, pensions and trusts based in Portland, Oregon. No fees are accepted, either directly or indirectly, from any provider of investment products. Your comments are most appreciated and please do visit my research archive at www.billparish.com.